The Xbox Game Pass will start rolling out today to select members of the Xbox Insider program today, with plans to launch exclusively for Xbox Live Gold subscribers before going live for all Xbox One owners this spring. Looking at the image provided above, we’ve also got Saint’s Row IV, The Mega Man Collection, Terraria, Mad Max, Lego Batman, Fable III, Mad Max and several fading box arts to look forward to. Update 2/28/2017, 1:00 PM: We asked Microsoft to clarify a few points about the service. 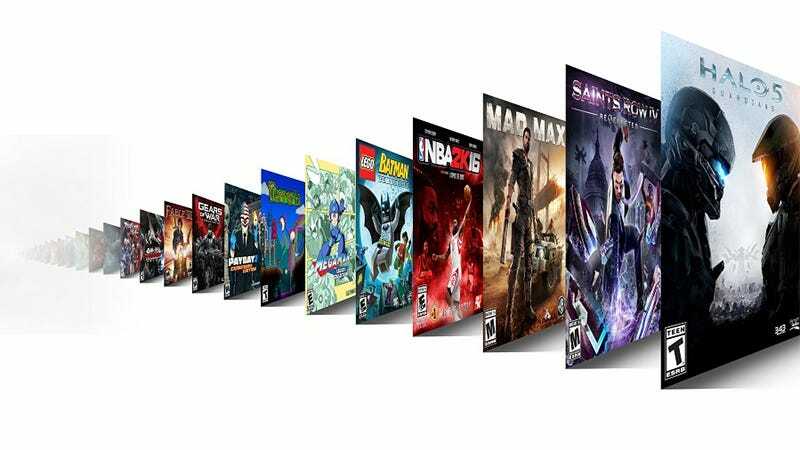 The Xbox Game Pass library will be updated on a monthly basis with games being added “sometimes” games leaving. Players will have access to all games on the pass as long as they remain in the library and the player remains subscribed. Should the player unsubscribe or a game leave the library, the games will be removed, but the save data from those games will be saved should the player restart the sub or purchase the game.